As published here in Marie Claire. 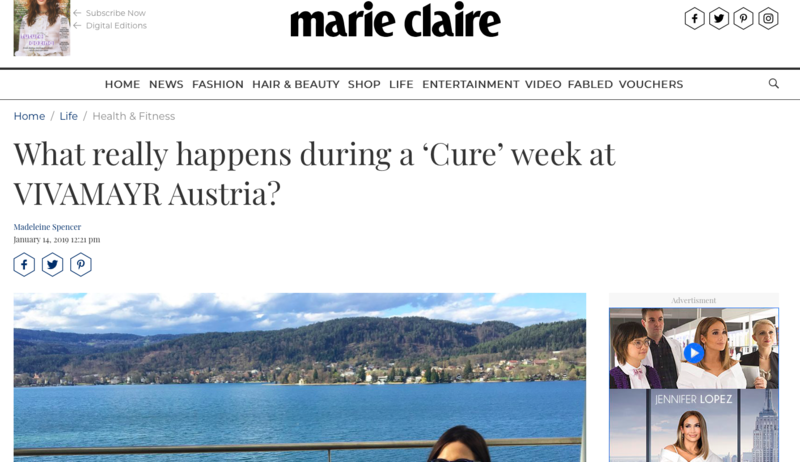 Three years ago, I embarked on my first ‘Cure’ week at the famous VIVAMAYR clinic in Austria. VIVAMAYR is the go-to health retreat of some for the most well-known faces in the world, with everyone from celebs (think Kate Moss and Elizabeth Hurley), to make-up artists including Lisa Eldridge and Pat McGrath, to artists and rock stars like Tracey Emin and The Rolling Stones frequenting both branches in Austria. Given its reputation for health overhauls, I thought it would be the perfect place to sort out some of the long-standing niggles I had. (I use the word niggles because I felt none of them warranted a trip to the doctor.) I’d get tired in the afternoon. Sometimes yoghurt or bread made me feel queasy. Despite exercising and eating a purportedly salubrious diet, my weight fluctuated seemingly at random, and fat accumulated around my middle. On their own, they seemed trifling, but together, they made me feel a bit out at sea, as if my body were some mysterious, unruly beast that I just had to live with. VIVAMAYR changed all of that, marking a turning point in my health and newfound understanding of what made my body thrive. I learned that my tiredness was unquestionably the result of a diet that spiked my insulin levels, that intermittent fasting wouald serve me very well, and that when focussing on nourishing my body, senses and mind rather than on a draconian regime, I would reach equilibrium. In the space of that first week, I went from bloated and enervated to energised and pulsing with mental and physical energy. More importantly, I left with the clarity that the choices I made hugely affected how I felt physically and mentally. Many talk in glowing terms about the weight loss that happens as a result of embarking on The Cure. I lost weight both during the week and after my trip, but I think to focus on that would be reductive. VIVAMAYR is not a diet clinic, and The Cure is not designed to simply shed pounds, but instead to bring the body back into balance through an all-encompassing approach, including yoga and massage and acupuncture and walking in the spectacular Austrian countryside. But their approach doesn’t rely solely on wellness practices or guess work – the doctors take blood and urine samples at the beginning of the week, checking for imbalances and asking pointed questions to get to the root of whatever sent you to the clinic in the first place. After a week in their Altaussee outpost that first time, I felt unassailably healthy for a good eight months, following their principles at home with relative ease and finding eating far less of a minefield. The second time I went, they tweaked a few things and I returned with higher energy levels than I’d had since my childhood. But then I had a more challenging year, working long hours from an office and travelling a lot, which meant my balanced meals were out the window, sugar was in, and my stress levels soared. 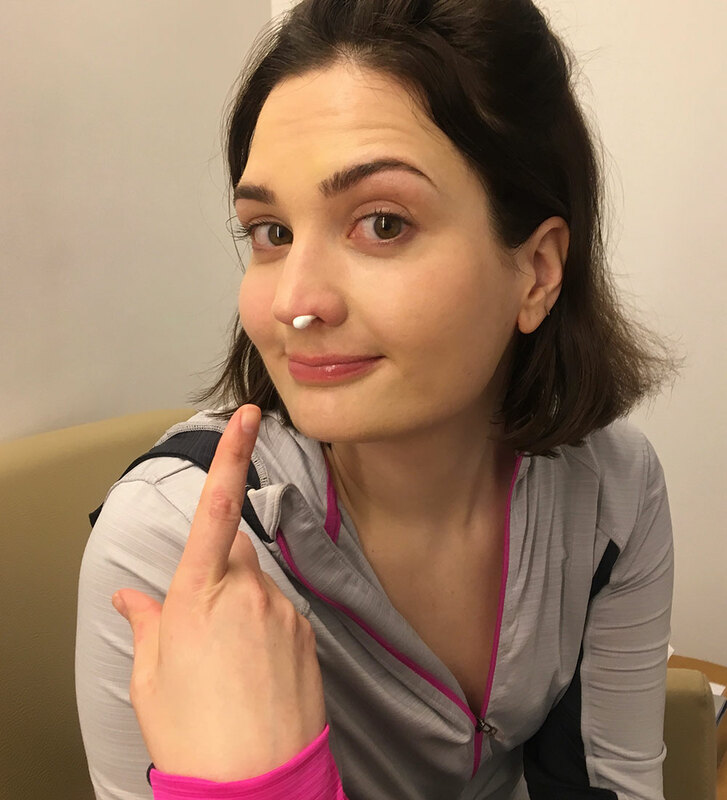 Unsurprisingly, I started to get ill fairly regularly as winter hit – picking up whatever bugs were flying around the office and spending around a week in every month in bed, coughing and spluttering. So back I went, this time to their Maria Wörth branch, in pretty bad shape. My stomach was rounded from fluid retention after antibiotics, my chest still sore from coughing, my eyes red after months of feeling exhausted. At VIVAMAYR, they’re borderline obsessed with chewing, encouraging you to eat in silence while focussing on the process of putting a little morsel of food in your mouth and then chewing it around 30 times. It’s tedious, laborious, weird – but it works wonders, giving your stomach time to recognise that it’s about to have some food come its way and produce the necessary digestive juices, thereby reducing indigestion and making their teeny tiny portions feel satisfying. An ancillary benefit of thoroughly masticating: your body has time to offer feedback on what it does and doesn’t want you to eat. I initially found that notion a trifle absurd, but, in practise, it does really work, and after around 10 chews I start to recognise which foods I actually wanted to swallow and which I’ve just shovelled in my mouth without thinking. Meals are meted out thrice daily, with gaps of around four hours between them. On previous trips, I’ve started to feel gnawing hunger on the first few days, but this time I don’t feel any by the end of day one, despite having only had broth for dinner. They heartily encourage the paring back of screen time. I vow to send out the odd social media post a day but otherwise stick to the rules. 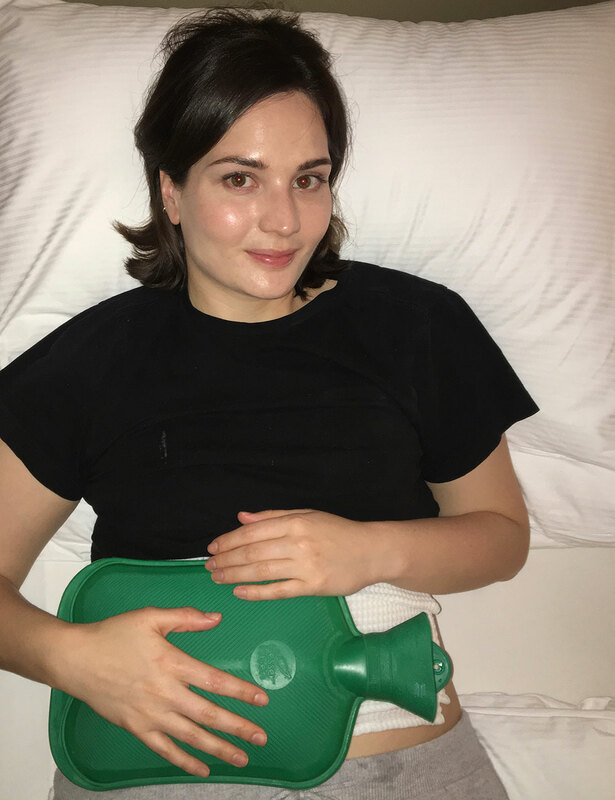 At night, I obediently head to bed at 9pm, tuck my water bottle onto my upper right abdomen to help the detoxification of my liver (the liver loves warmth, apparently, and is soothed by nightly applications of it). I then flip the switch that kills all power – and WiFi reception – in the room and am confronted by silence and darkness, the likes of which I never have at night in my place in London. I go to see the doctor first thing in the morning to have a once over. They love massaging the stomach here, and doctors do it daily during your tenure as a diagnostic tool, and because it helps to encourage what they politely describe as ‘elimination’. The doctor tells me that I’m puffy and need to focus on gently upping my circulation while respecting that my body battled a lot while poorly. She suggests yoga, infrared sessions in their infrared cabin to soften the muscles around my lungs that are tight from coughing, and eating only as much as I fancy, which oddly, given the meagre portions, isn’t a lot. I feel peaky and exhausted and wish I could have some sugar as a pick-me-up. The results from my doctor’s appointment are back: not only are my antioxidant levels low thanks to said illnesses, but I have a parasite living in my intestine. This REPULSES me. The doctor sanguinely tells me that that’s the usual response to what is a surprisingly common issue. Parasites, she explains, don’t cause a hell of a lot of damage; by nature, they want their host to live. They just siphon off a bit of nutrition and create mucous plugs which mean the intestinal wall won’t absorb as much goodness (again: repulsive). The sum effect: what few greens I was managing between bouts of tonsillitis were either being enjoyed by my parasite or being mostly stopped from doing their good work by the mucus it formed. There was an additional problem that was causing the weakness in my tonsils. As a child, I used to suffer from it each winter, and the doctor tells me that I have some scar tissue as a result which, according to my doctor, renders my tonsils a weak spot until the tissue healed. To help break down the scar tissue, she inserts some French acupuncture needles on and around my ear. After that, I’m sent to do some yoga, have a mud and hay bath (absurdly relaxing experience – you are cocooned in warmth and left to recline as the hay pack works its magic on the liver), inhale some salinated air for my lungs, and do something called ‘Roeder Nasal Reflex Therapy’, which involves sticking essential oil-soaked cotton buds in the nose to cleanse and treat sinuses. I haven’t mentioned being hungry much, because it simply isn’t present. Some fellow guests complain about the gnawing hunger on the first few days, but I am still mostly riddled with nausea and the sense of needing to be drained. 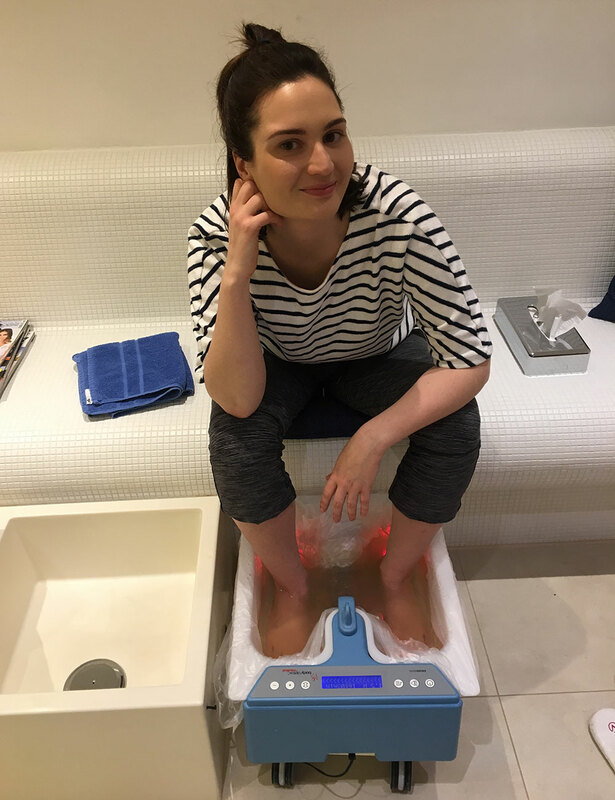 Apparently, my instinct is entirely correct, and today I am sent to various treatments designed to help my body to do so, from my usual daily stomach massage, to an electrolysis foot bath to drawn out toxins, to a lymphatic drainage massage to reduce water retention. 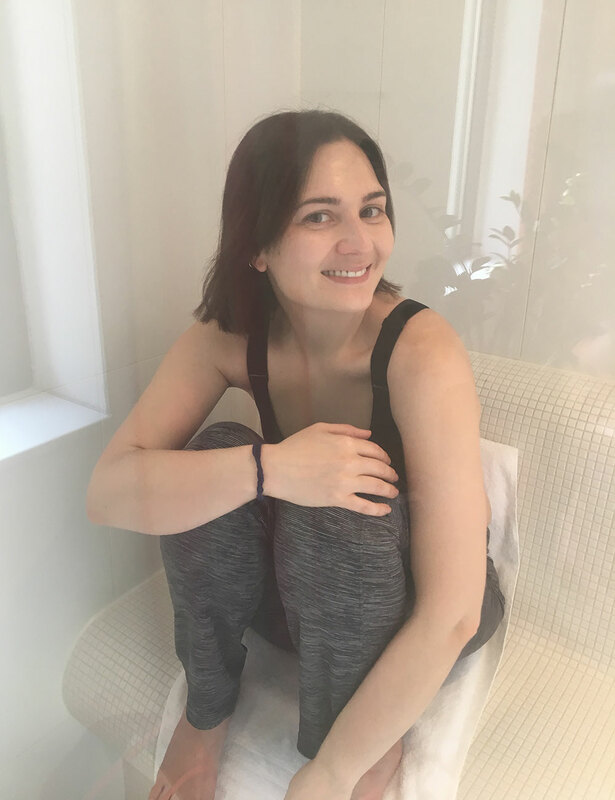 My energy levels fluctuate as my body is still making the switch from running on sugar to fat, and I veer between falling asleep on the sofa between treatments, to wanting desperately to head out for a stroll around the picturesque village. I do both, when I’m inclined. Each time I’ve embarked on The Cure, I’ve had my doubts during the process. When hungry, tired, and guzzling weird salts, it’s hard to imagine that doing so will really reap rewards. This time round, I wake on day five out the woods. My senses are heightened and I savour food properly for the first time in months after colds had robbed me of my ability to taste. I feel calm, both in my body and mind. During my doctor’s appointment, I am reminded that the adrenal burnout I was experiencing isn’t now ‘fixed’ – it’s a spectrum, she reminds me, and I was getting close to the wrong end. To redress the balance takes time and relies on living a measured life with some exercise, good food, and time with friends. She tells me that it can take up to a year to recover from a period of acute mental or physical stress, and that I should make plans to treat myself in a way that props me up rather than depleting me going forward. The doctor was right about the back and forth nature of the process: I feel a bit nauseated again today. But I don’t have much time to dwell on it, because I’m going for a colonic. 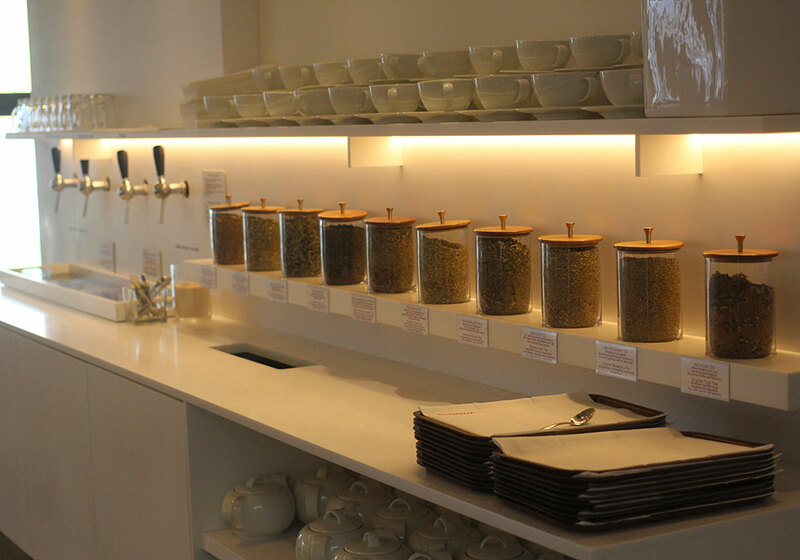 I’ve had them on previous visits to VIVAMAYR, and don’t feel too much dread – they’re uncomfortable, sure, but overall worth it as part of the process. This time, it’s hellish. I alternate between feeling relieved and sweating profusely as something akin to flu sensations set in. Apparently, this is the norm after having been quite ill, and I am reassured by the nurse administering the treatment that actually I’ll feel a lot better afterwards. I do, but I’m exhausted by the time it’s over and thrilled that I have an appointment with Carmen, a masseuse spoken about in reverential terms by the regular patients (which comprise around 55% of VIVAMAYR’S clientele at any one time). Carmen goes to town on my back, releasing tension deftly. I come to understand why she’s the masseuse I have been told by all the guests to ask for. After six days of being fed tiny meals of highly nutritious food and treated to a roster of treatments, I enter the doctor’s office optimistic. 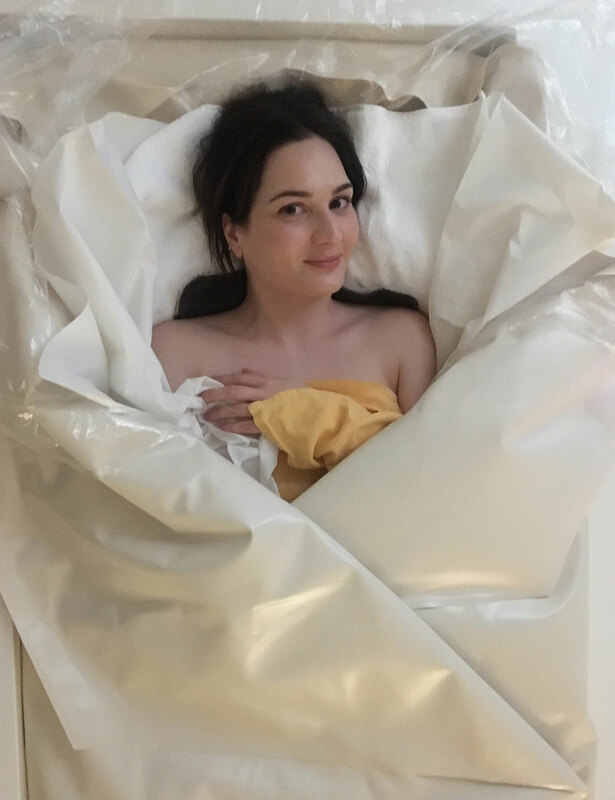 I know my fluid retention has reduced massively as my stomach is flatter, and also that my lungs have all but recovered thanks to sessions in the salinated booth and all that mountain air, but I’m excited for the pat on the back from the doctor. Back in London, her words resonate. I scale back my work commitments, start to think in earnest about which relationships are nourishing, and consider what is a valuable use of my finite energy and time. It’s now been eight months since my visit, and I still am reaping the rewards. Of course I’ve had some very late nights. Of course I’ve eaten masses of sugar over Christmas, and of course I sometimes still work up to the wire. But I have a better baseline, am more centered. And that’s precisely why I recommend a week at VIVAMAYR to anyone who can make the time and afford it: it is much more than merely a week away, or a speedy fix, but an opportunity to properly reset, rebalance, and reboot, all while surrounded by the stunning Austrian countryside. Thanks for this post Madeleine. I’m researching these kinds of retreats after years of battling a chronic illness. This was such an informative post!